REE recently completed the design and construction supervision of an upstream batter remediation project for QGC. REE were awarded this work due to our pragmatic and responsive approach employed on previous remediation projects for QGC. The works included a focused geotechnical investigation and design documentation – all completed in rapid time frame to enable works to commence quickly. Achieving the client’s tight time frame was critical to ensure the protection of the upstream batter before the wet season commenced. The works were overseen by REE and consisted of cutting the batter back to a stable profile and covering it with bituminous geomembrane (BGM) for erosion protection. 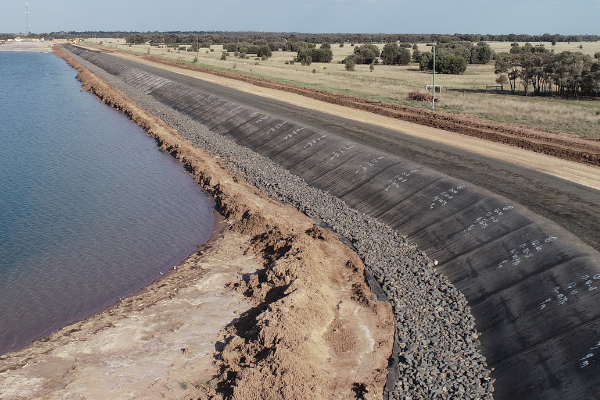 The pragmatic solution enabled 1.3kms of embankments to be re-mediated in less than eight weeks. REE’s design also include a pump station platform and pipe crossing. The original pipes were previously placed over the crest with a basic soil ramp, which was substituted for an installation through the crest of the embankment. This made the facility safer for operators in light vehicles accessing the pump station platform via the crest. If you’re looking for specialist design and construction oversight in a timely manner please contact us.